AECI - Aircraft Parts, Engineering and Manufacturing Services - Down Lock Springs (pair). Beech Sierra Main Landing Gear Side-Brace Down Lock Springs. Beech Models A24R, B24R, C24R, all years, all MC-prefixed serial numbers. AECI P/N 169-380043AEC is an FAA-PMA approved replacement spring for all of the Beech Model 24 series of retractable gear aircraft. These are the Model A24R, B24R, and C24R airframes, including all years, all variants, and all MC- prefixed serial numbers. Model names for these aircraft include the A24R Musketeer Super R, plus the B24R and C24R Sierra. The AECI spring mimics the Beechcraft OEM P/N 169-380043 Spring, for which replacement parts are both seldom available and severely over-priced, if found. Despite the improvement in both quality and appearance, the AECI passivated and re-plated stainless steel 'lifetime' springs are actually less expensive than new or used Cadmium-plated OEM replacements. A pair of new AECI stainless-steel springs costs much less than the price of a single Beech Cadmium-plated spring, when those can be found at all. The Beech springs have been unavailable for as long as five years at a stretch, forcing owners to search salvage yards for replacement springs. These new AECI replacement springs can be installed with a logbook entry only, as they carry an FAA-PMA endorsement rather than an STC. Beech recommends replacement of the Main Landing Gear Side-Brace Down-Lock Springs when aged, because the required force to unlock the side brace falls below specifications. It should require 18 to 22 pounds of force to 'unlock' the over-center side brace; stretched and aged springs will often fail to meet this specification. Since the OEM Spring-steel parts had sacrificial Cadmium plating for corrosion protection, that plating has long since been compromised. Virtually all original springs, and most in-service replacement springs, have long since developed rust pitting; some are severely corroded. Most have been cleaned and repainted multiple times, which simply covers up the weakened spring. 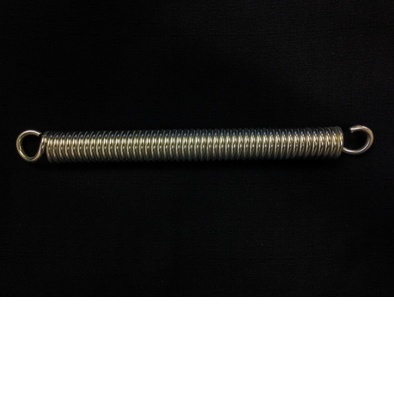 Most removed original springs will exhibit distortion and will fail to meet the Beech tension specifications. In almost all cases, the appearance of the original springs greatly detracts from the cosmetic appearance of a refinished aircraft, or will just as soon as the fresh paint cracks off of the repainted spring. With the introduction of these new FAA-PMA Main Landing Gear Side-Brace Down-Lock Springs, owners of these airframes finally have an affordable option to maintain both the function and the appearance of their airplanes. There is no specified required service interval on these new replacement springs. As these new springs should be immune to corrosion in most environments, they should last for a great many years with nothing more than the unlocking tension check, which should be performed during each Annual Inspection. PLEASE NOTE! These replacement springs are being sold only in pairs (sets of two springs) to help assure that the landing gear operational resistance remains matched on both sides. You can refer to the OEM Shop Manual instructions for replacement and installation of these new springs. However, field experience has shown that it is far easier to replace the springs if the donut stack tube nut is removed and the lower gear leg is allowed to pivot forward around the knee pin. This will also enable you to replace the lower spring-attach eye-bolt, P/N AN44-11A. These bolts are available from Aircraft Spruce for approximately $7 each. The original bolts will have rusted badly. The replacement bolts will have new Cadmium plating, protecting the spring, bolt, and casting from corrosion. They will also add to the finished appearance of the new installation. CAUTION! If your gear cushions are less than about two years old, they may not yet have developed enough 'set' to allow the needed working time for spring and eye-bolt replacement. If they swell out too quickly, you will be unable to get the stack tube nut re-started on the top of the casting. It will help if you can get the work done and get the weight back on the gear as quickly as possible, so that the weight of the plane will help re-compress the cushions and enable nut reinstallation. You must also make certain that the cushion height is properly re-set to provide a minimum clearance of 1/2" between the tire and the front of the wheel well on retracted gear. ALL standard gear testing MUST be performed after any gear work on a retractable aircraft. This includes verifying that the gear position switch turns on the gear pump with no more than a quarter-inch of brace travel from the lock position. This switch test applies to all three landing gear. Members can visit the Beech Aero Club (BAC) website for additional information and support. BAC Membership is only $50 per year and brings with it an incredible array of operational, technical, and parts support, as well as social fly-in events.